The VFX-1 review is on hold for a little while as I’ve come to the conclusion that it doesn’t entirely get along with the ATI graphics card the seller included. The card I’ve got could just be plain faulty as I’m seeing some interference when using it both on the monitor and VFX-1. It might explain why it refuses to work with my CRT monitor altogether. I have managed to get stereo-3D working in Descent 2 and Quake and it is quite something. Those two games use a 3D mode where the image is shown on a regular monitor as alternating lines which the hardware/software splits into two images. System Shock and Magic Carpet use a different mode with two side by side images. This refuses to work no matter what I do. System Shock is especially strange as I can see the cursor floating around but none of the scenery behind it although it’s clearly there on my monitor. I was looking at a review at http://www.vrtifacts.com/hmds/retrospective-photo-review-of-forte-vfx1-virtual-reality-system/ which has some pictures taken through the lenses and the images shown there are way sharper than what I’m seeing. That reviewer was using a Trio64 graphics card and there happens to be one on Ebay with no bids ending in a few hours for 99p which I fully intend to pick up. In the meanwhile, I’ll see if I can’t turn up some more cards to try out, and maybe swap the VESA cable. This is the last Origin demo which I’ve been able to locate so if anyone has any more feel free to send them my way. It’s another flight sim so I’ve only had the briefest of looks at it. 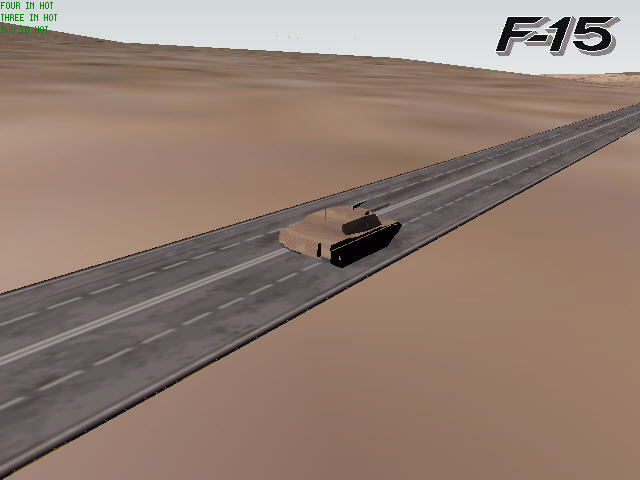 It’s a similar demo to the Longbow 2 one, only this time there are clear mission objectives. 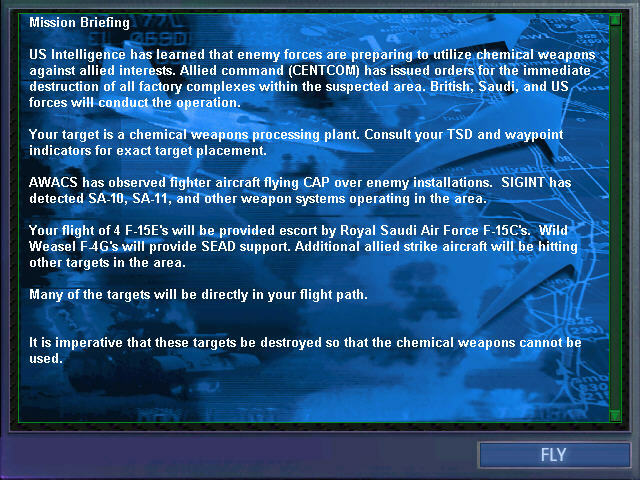 The task is to take out a chemical weapons factory. Even defaulting to casual mode, being dropped straight into a sim like this can be daunting. The wise decision was taken that the demo would run on autopilot, unless you choose to move the joystick and take over control. When on autopilot, the demo swaps views constantly to show all the different planes, ground vehicles and buildings. There is a ton of opposition and friendlies around to show off as many game objects as possible. From a modern standpoint, some of the autopilot views possibly don’t show the engine in it’s best light. A building close up is a rectangular block but you wouldn’t normally be so close for this to be apparent. It’s still impressive enough judged against other games of the time but however pretty the engine, it’s not all that likely to win me over to the genre. This doesn’t mean the end of the demo’s as I have a pile of Looking Glass games still to go among others but I’m long overdue to get stuck into a full game. I’ll have a quick look at any Terra Nova demo(s) I can dig up and then pick the next one off the list. The second campaign is set in Iraq and instead of being based on a fictional conflict, is based on the Gulf War. This at first generates a bit more interest for me with the link to real life, although I have to say that the novelty wore off quite quickly. The more realistic nature of the missions made them less interesting to fly with huge distances to cover at times just to get between waypoints. There was possibly less interest to the missions themselves also, since Iraq doesn’t really have anything resembling defenses. You might come up against the occasional MIG but the fact is that the US had a ridiculous technological advantage in this war. The terrain is marginally different in this campaign. It’s dead flat all the time for every mission but there are some new textures and buildings and the cities look good lit up at night. The missions themselves are mostly bombing runs similar to what went before, albeit with different targets such as power plants or even the presidential palace in a later mission. I don’t get to use the bunker busting guided bombs I had in the first campaign, although I understand that I might have had this chance if I’d not failed a few of the missions and consequently been assigned easier ones. There were a couple of missions where I got called away from my objectives to support ground forces. These were the ones I struggled with, mainly as I don’t know my way around the navigation systems well enough. I should have put more effort into these but my patience for F-15 definitely ran out today. I quite enjoyed yesterdays first campaign but aside from the long periods of inaction in this campaign, I also ran into stability problems and they always occurred after I’d spent ages completing the mission and was on my way back. This started to wind me up after the first 3 or 4 times so I more or less dashed through the rest of the game as quickly as possible. It appears that you will win the campaign no matter what. Losing just changes the missions you fly to easier ones. This makes the campaigns extended tutorials which tailor themselves to your abilities. Clearly this is a decent game but not one that I was ever likely to be a fan of myself. With this sort of game you get out what you put in, and I put in the bare minimum. Overall, I was more impressed with Longbow 2 than this but they are fairly similar products other than the aircraft they are simulating. It’s not exactly a high point to end on for me, as I really did have to force myself to play through the rest of this campaign once the crashes started happening. There haven’t been too many games like that in this blog, and often games I wasn’t looking forward to I actually enjoyed but this ultimately wasn’t one of them. I’d rather not finish on a low point which leaves Noctropolis to raise the bar. I’m far from clear on how much involvement Origin had in it but it was definitely some, which makes it an Origin game in my eyes, at least for the purposes of this blog. Whether it’s any good or not is another matter but there is only one way I’m going to find out. I’ll be starting that later today with the aim of finishing it before Christmas. 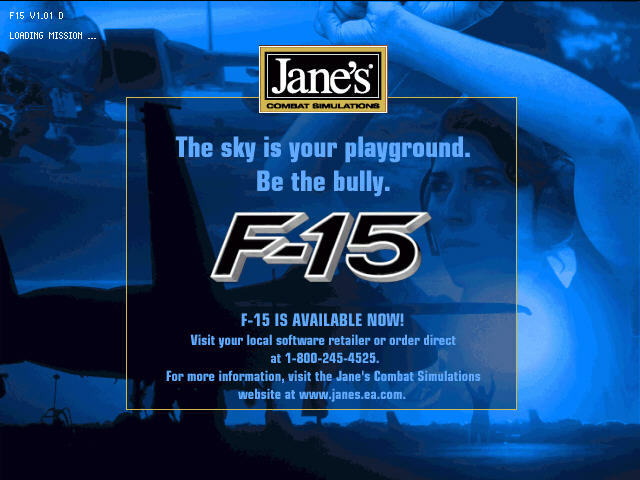 It’s been a long time coming but it’s time to get started on Jane’s F-15. Apart from Ultima Online games, this was one of the final games published by Origin before their swan-song with Ultima 9. 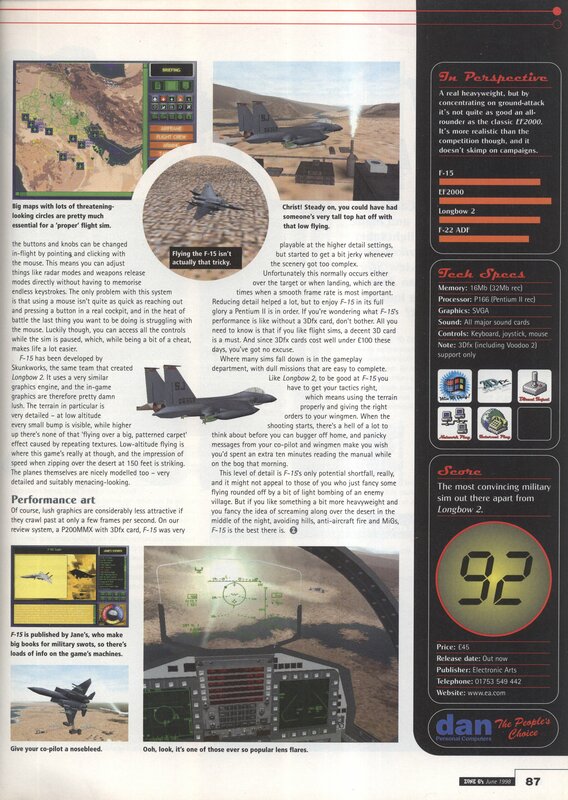 It was published in 1998 by Origin Skunkworks. This team would eventually split off from Origin and go on to work on some more Jane’s games none of which I’m going to be playing in this blog. As you would expect it’s a flight simulator. 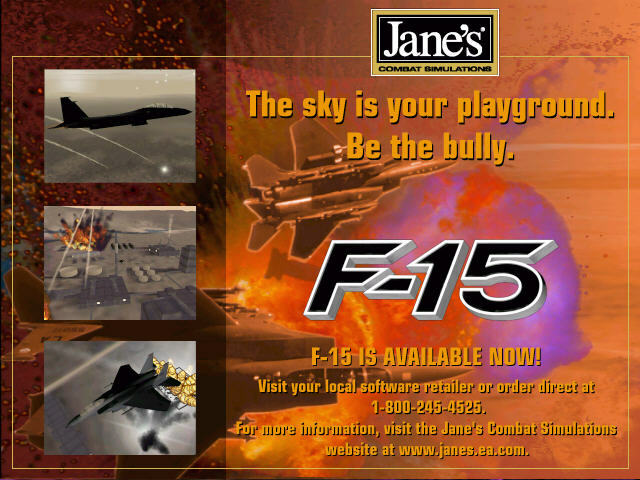 There are no other planes included and it’s purely the F-15. I’ve said it before, but flight simulators are not my thing and I’m playing this game simply to make up the numbers. I’ll try to keep an open mind but I’m basically going to rush through it as quickly as possible as there are plenty of games after this that I’d rather play. I thought the Longbow 2 manual was big when I played that game, but I hadn’t seen the one that comes with this. It’s so large they’ve used a metal coil to keep it together rather than binding the pages as in a normal book. On the bright side the game does come with a much smaller second manual containing the essentials to get started. I glance at this but basically just jump straight into the training missions of which there are plenty. These lessons are brief and each designed to teach a single thing. I.e. taking off, shooting a ground target with a gun, etc… I start out simple with taking off and flying through some waypoints. It takes me a while to realise that my waypoint is shown with a tiny rectangle on the HUD but the casual flight model is very forgiving so the actual flying part is simple. While I’m out here, I take the opportunity to fly near some buildings on the ground. The mission is in Bahrain so there are oil wells around and lots of sand. The graphics are reasonable without being anything too impressive. I’m on my Windows 98 PC with the 3dfx graphics card again for this one and old as that machine is, the game runs perfectly smoothly with everything on maximum. Origin didn’t release many games in this period but it seems as though all of them were primarily 3dfx glide games. 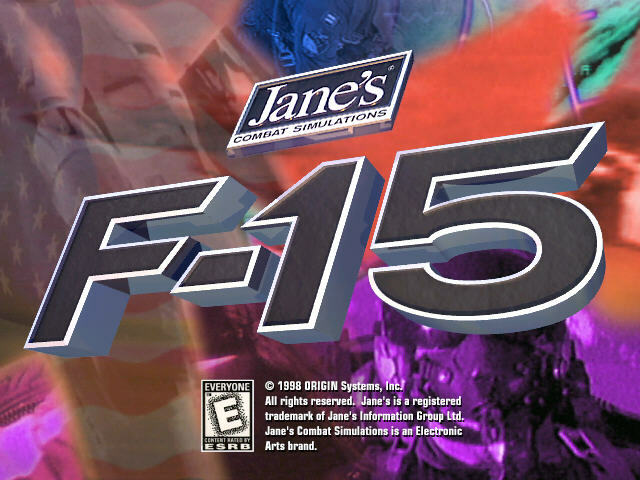 F-15 doesn’t offer Direct3D support at all out of the box, but there was a patch released later. At the time this was being developed 3dfx were dominant and Direct3D was still an immature technology so it’s no surprise that developers would choose to support Glide in preference. Direct3D only really became useful once the competition in the graphics card market started increasing and you could no longer afford to limit yourself to one set of customers. On one of the missions, I have to fly down the side of a mountain range to hide from enemy placements. There is some terrible texture creeping on this map. It appears like a massive earthquake is occurring in front of me as I fly along. I’ve only seen this occur on the one mission but it’s not good when I’m more or less using the recommended hardware. Maybe it wouldn’t happen on a voodoo 2, but it’s certainly not something I’d like to see too much. Other training missions prove to be even simpler than this first one. Learning to shoot an in air target with the gun for instance. You start in the air directly behind the target, line it up and fire. The mission takes 10 seconds. 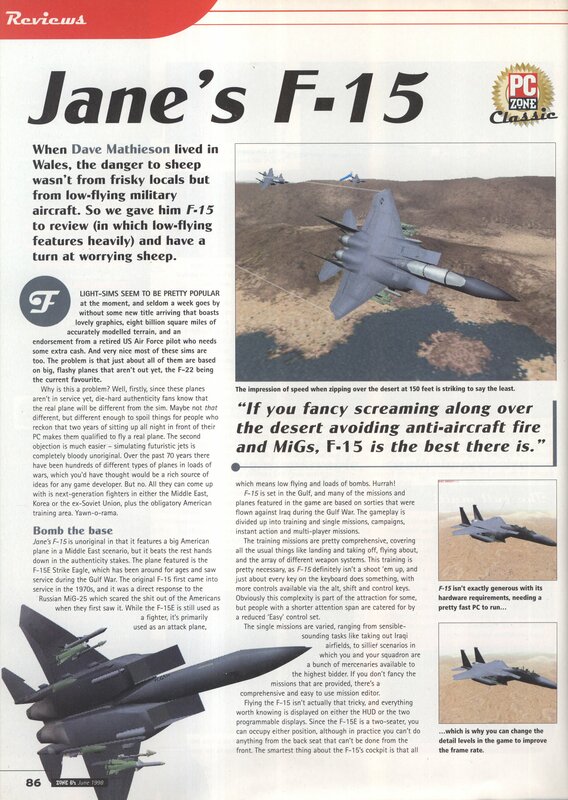 There are also identical missions except for using the two air to air missiles you have on the F-15. The medium range missile locks on from 18 miles away so I never even see the plane I’ve shot down. All the systems in the plane are very familiar and anyone who has played Strike Commander will feel at home here as there is very little difference. By far the hardest of the missions is the air refuelling one. This is so tricky that they included an automatic option which I gladly take after getting nowhere doing it the hard way. After this there are a couple of missions to show how the tracking systems work, and another couple on ordering your wingmen around. These training missions more or less do their job but are poor compared to Longbow 2’s. They didn’t have any speech and only some had brief text instructions at the top of the screen. They also missed things out and really did only cover the basics. Having said that, I wasn’t bombarded with technical details like in Longbow 2 so this did at least teach me what I actually needed to know. With the training missions out of the way, I decide to start one of the two campaigns. There is a not so varied choice of either Iran or Iraq. I go for Iran. The back story is told out with reams of text. Basically, Iran is trying to invade it’s neighbours and take over oil production and we have to stop them. There is a brief cutscene of the usual stock footage with rock music played over the top of it which doesn’t serve any particular purpose…. 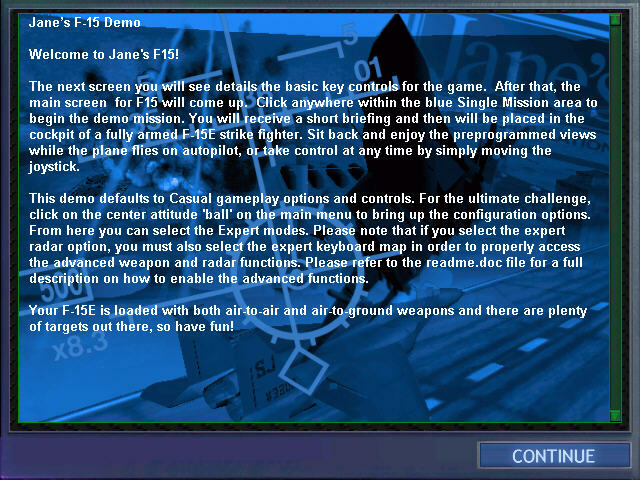 Then it’s more text again to introduce the first mission. The interactive battlefield mode from Longbow 2 doesn’t appear to be present here and instead its back to the set mission structure. This gives more scope for a plot to the game so this is fine by me as someone who is going to play the game once and never again. It will reduce replay value however for anyone else. 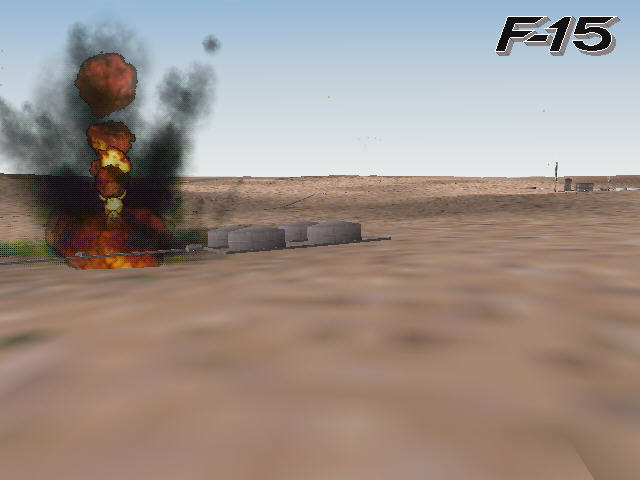 In the first mission, I have to intercept strikes by the Iranian air force on oil fields. This involves flying along a lengthy route looking for them. This first mission immediately highlights my problem with this sort of game in that I’m flying for about half an hour and nothing happens. 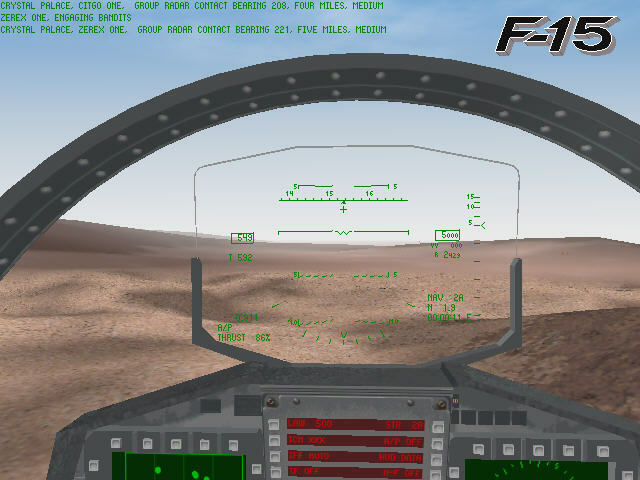 I mess around with the controls for a bit and find a nifty virtual cockpit mode as shown in the screenshot but thats about as exciting as it gets. Eventually, I give in and go back to read the reference card. This is split over 8 pages, and apparently only covers the basic controls and you have to read the manual for the rest….. This is my other problem with flight sims. I find options to skip to the next waypoint and also to compress time though which should make the game far more fun next time I try it. I leave it here for now and will see if I can’t get a few missions done tonight.